I am really sorry to do this to you. Because, you know, we’re like friends. BUT I imagine if we were REALLY friends I wouldn’t do to you what I am about to do. I am going to give you, in advance, a weight problem. If you have never struggled with your weight, God bless ya, but that is about to change. There are no exercises to help you here. No solution to what is going to unfold in your life in the next minute. It’s really mean, I suppose. But since we are friends, I must share. I am going to share with you a recipe for donuts. Only a remarkable pan and some cake mix. Last week I attended a really great Blogger Workshop hosted my the incredible people at Wilton. The Wilton tent sale is amazing…rows and rows of products all marked down 50%. That is where I gained possession of the donut pan. I am scared of its power. A food that would once be deemed “highly unlikely” to be procured from my kitchen is now going to be a staple. I might as well get a conveyer belt and a sign that says “Hot Donuts Now”. Well, now you won’t have to. You can have hot donuts in 10 minutes. I wish I were lying. Lord help the holes on my belt…they are about to be tested. Don’t say you weren’t warned, friend. 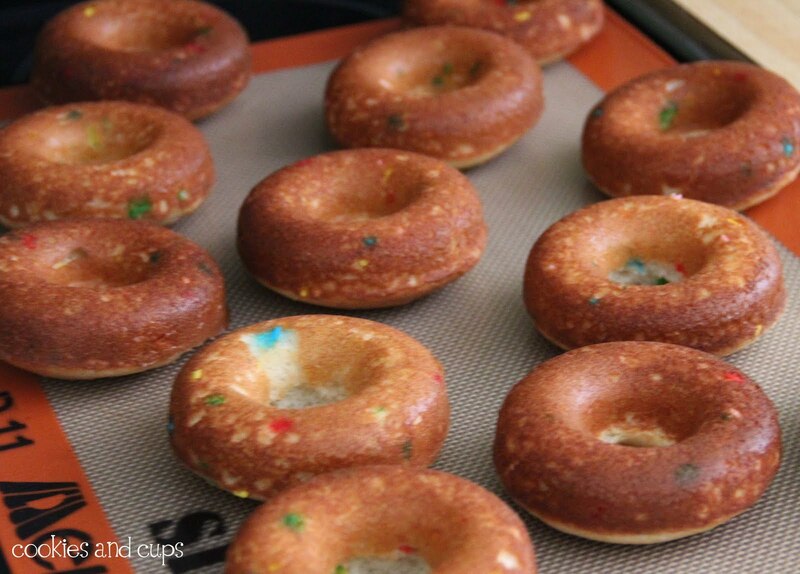 Get your cake mix ready..
Cut of the corner of the ziplock and squeeze batter into each donut mold, filling 2/3 full. Bake for 7-9 minutes until the tops are slightly browned and spring back when touched. 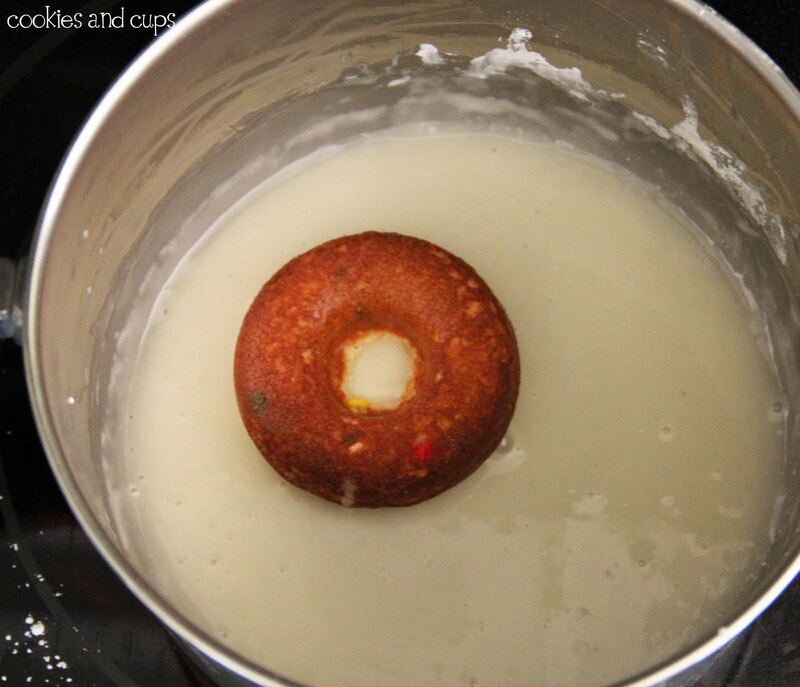 Let donuts cool in pan for 5 minutes and then turn pan upside down to remove. I just dropped each donut into the saucepan and quickly coated, transferring onto a cooling rack with parchment or a silicon mat under to catch the glaze drippings. Then frost them again. I know. Stir both ingredients together until smooth. 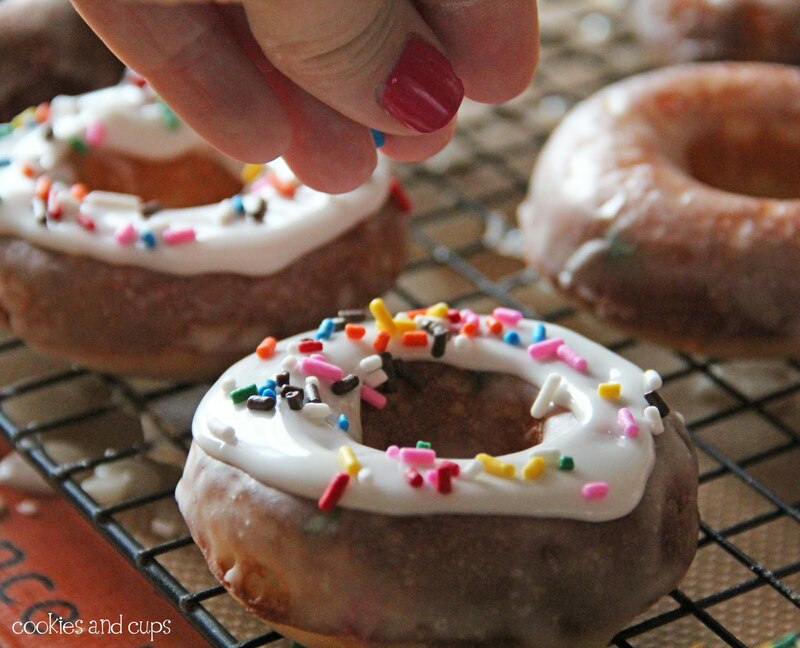 Spread approx 1 tsp of frosting on top of each donut and immediately coat with sprinkles. Voila! Easy, yummy and did I mention DOUBLE glazed? Now back to the pan. You need one of these in your life. Spray the donut pan lightly with cooking spray. In mixing bowl beat all ingredients on medium speed for 30 seconds. 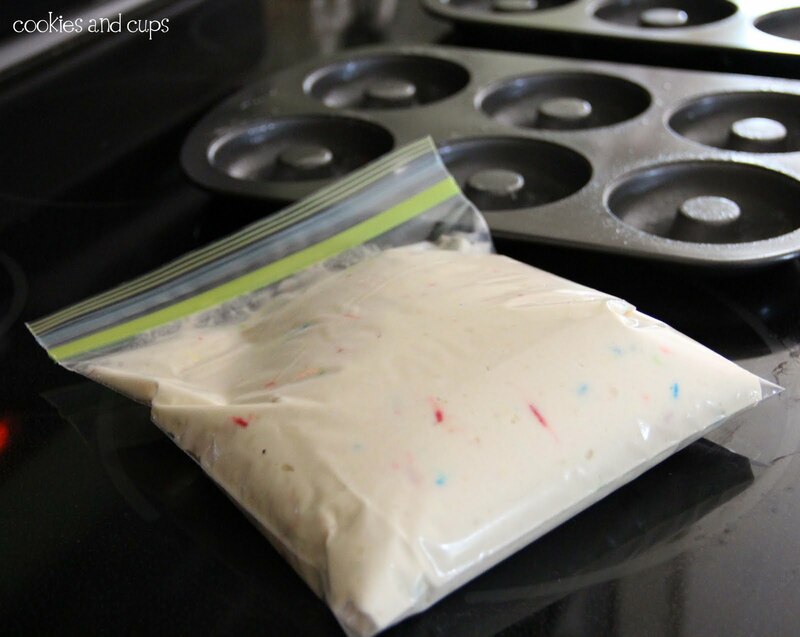 Transfer batter in a ziplock bag. In medium saucepan combine ingredients with a whisk over low heat. Stir until glaze is smooth. Now coat your donuts with the glaze while burner is still on low. If the glaze gets too hot remove from heat. You don’t want it to burn, you just want it to stay warm and thin. Let the glaze set…about 15 minutes. I had wondered if I could just use a cake mix to make donuts…I got the pan months ago but other then washing it and starring at it I haven't made a thing with it! I am so going to the store and picking up a cake mix, this will be soooo tasty!!! My co-workers will love these! Thanks for putting it up!!! YUM! Now I'm wishing I would've picked up a couple of those pans. They're so pretty. I heart donuts and double glazed ones I heart even more!!! It has been years since I have been to the wilton tent sale:-( A friend and I used to go ever year…loved all the goodies I used to find!!! I want one so bad now. I've been looking at them a lot lately! I've been going back and forth about if I should get one of those pans. Don't be creeped out by the very pregnant lady banging on your door at midnight begging for a donut…you started this craving! Those look delicious and now I'm adding a donut pan to my baby registry. It's practical, right? i just bought this pan too! it's awesome! and i love your double glaze idea…i did them recently too, but i may try this second glaze idea next time!! they look great! these look AMAZINGGGG! now I need to buy a donut pan!! Oh my, these do look good! I bet kids would go crazy over these. Ohhhh I need this pan in my life before my baby is born so I can get fater now. 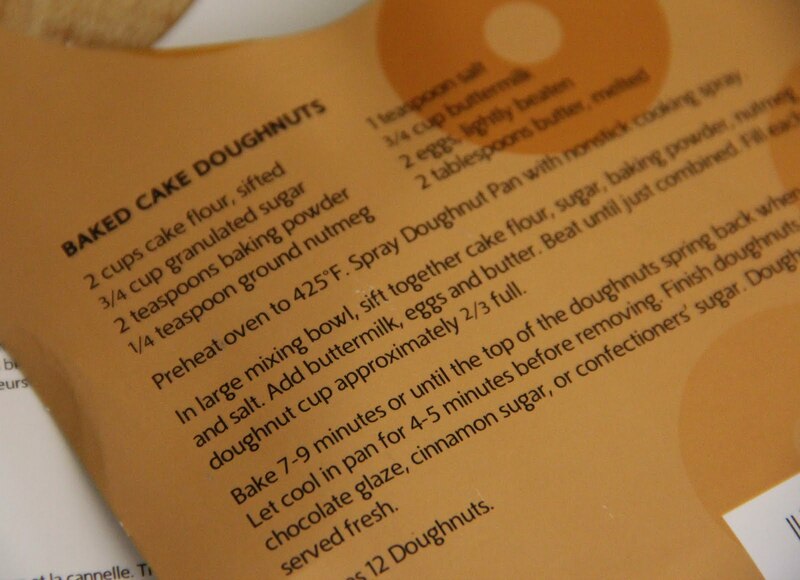 I am not a donut eater, but I will eat from this cake mix recipe. 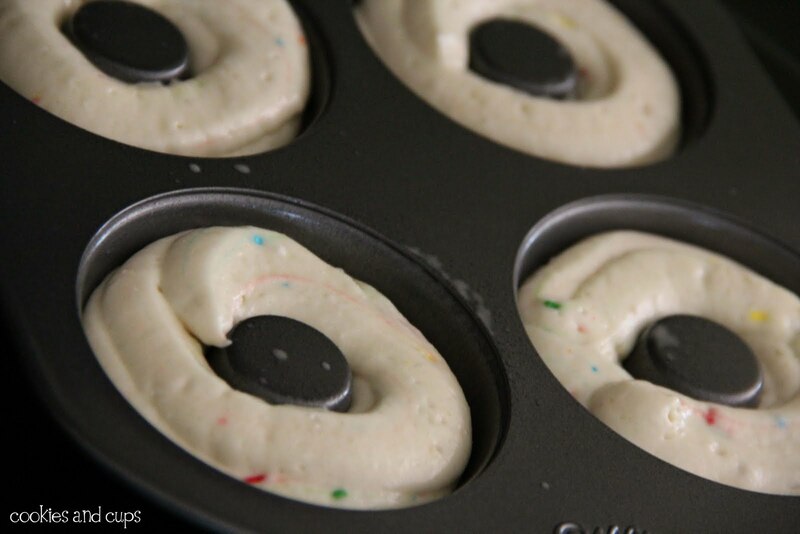 Funfetti cake mix in that donut pan? I'm not sure if I should thank you or punch you? You know, I've been searching long and hard for a recipe to make for father's day dessert. And now here you are getting it right in one shot! OMGosh; you're so evil to make this classic treat so accessible and easy for us to make! They came out so awesome! It's very good that I do not own one of those pans. I may have to ban anyone from ever buying me one…..those look so delicious! Well, I guess I'm off on a quest to buy this pan now. Diet, hell! I'm getting a pan tomorrow, and when my grandson (4 1/2) is here in a couple of weeks, we're makin' your donuts! We gotta splurge now and then! Love your stuff! 10 minutes? That's incredible! I never thought donuts would be a "common bake" in my house but looks like that's about to change. I can't believe there's no messy frying etc. These look just delicious. I am ignoring your statement about their potential to make me gain weight haha – I don't care – I have to have one of these pans! I just got a mini donut pan! We tried the recipe that came with it (not Wilton, don't worry) and it was horrid. Now I can't wait to try this one because seriously, can anything Funfetti be bad??? Hi! 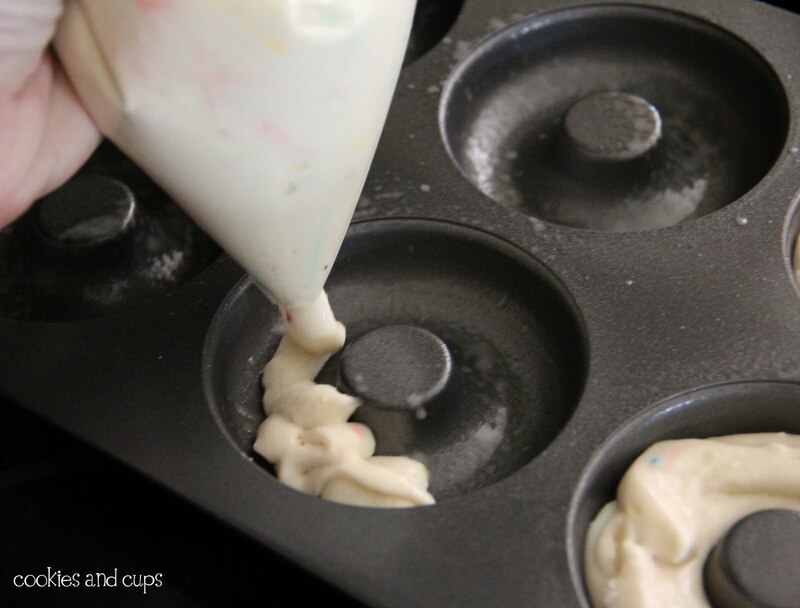 These look amazing & so fun to make! Wow, these look SO GOOD!! for once i am glad i DIDN'T get picked to attend a PR trip . . . because BFFs or not, that pan right there would be my undoing . . . and honey, i don't really have that far to go . . . no siree Bob, not far a'tall . 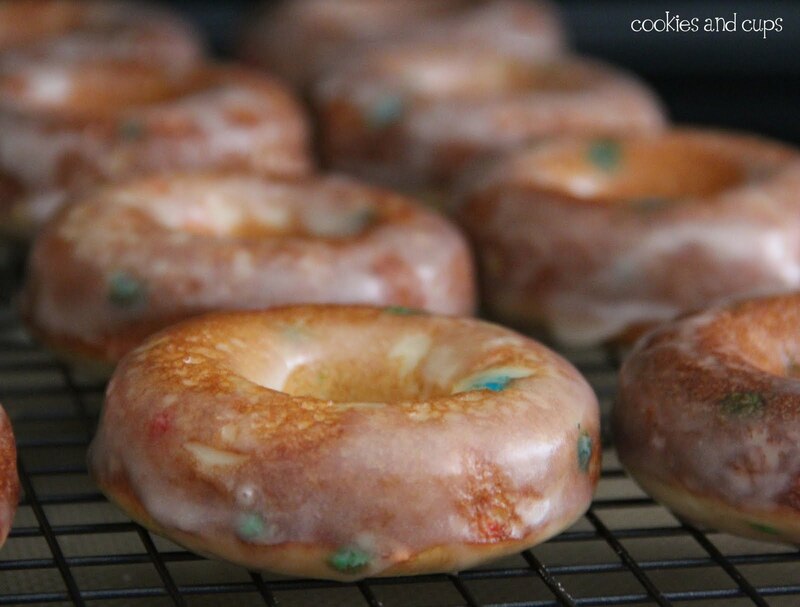 . .
Well, I didn't think I ever needed a donut pan….until NOW. Oh my goodness. Pinned, stumbled, tweeted…and whatever else….these are fabulous, Shelly. 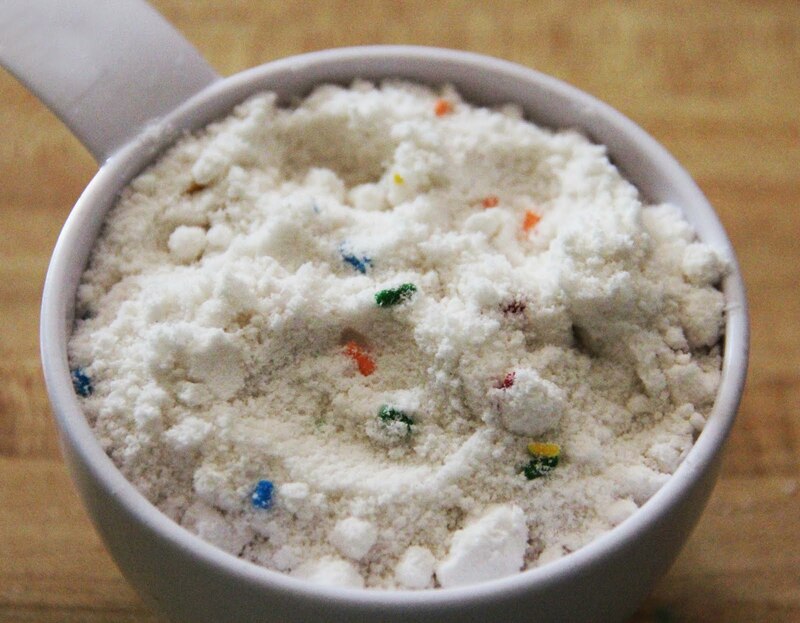 Added this to my Funfetti recipes round up! I just love these so much! I just know my little girlies would have so much fun making these and, of course, eating them. Really so fun! Yum! 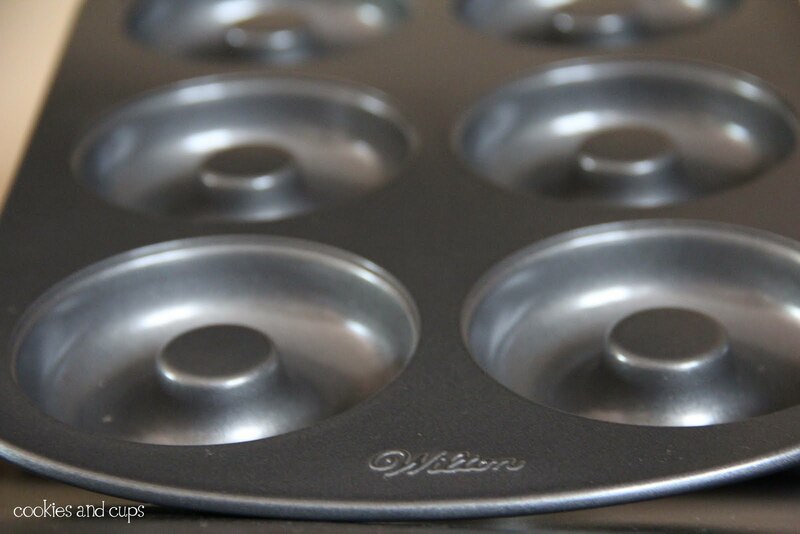 I didn't realize Wilton did a donut pan too – thought I had to order from somewhere else. Thanks for the weight, I mean recipe!! Oooooooooh!!! It's the part of the cake I love, the crispy edges…did they have icing tips…I shouldn't even ask, but I have to know, you have me craving sweets in the am, lol! I'm a brand new follower (as of yesterday) but already I think I love you. Seriously. I'm not weird. You just totally get me in a way my husband never has. haha…no really. I wish my computer had a scratch and sniff button. I'm going to buy a new pan today. Can you guess which one? I should probably pick up a new pair of jeans the next size up while I'm out. Keep up the yummy work – you rock! Thank you for posting this! I bought one of those pans several weeks ago and have been having trouble finding a non-frying recipe. My kids will love this! Oh. My. 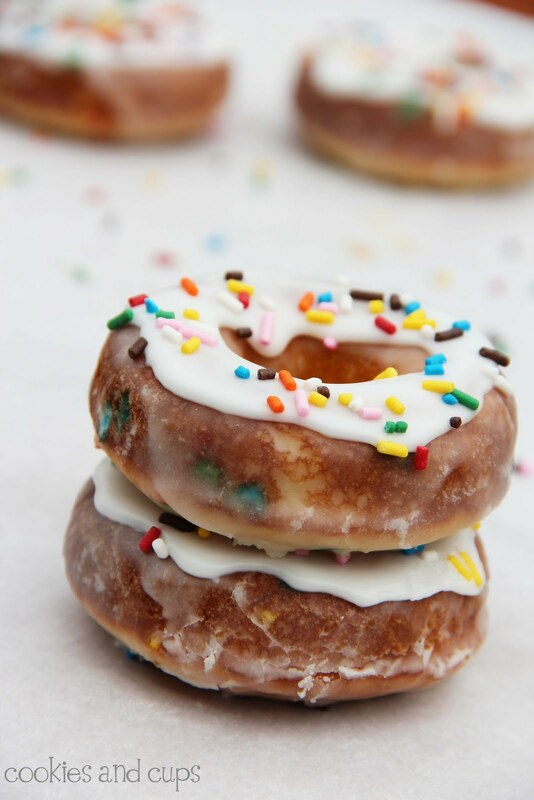 Double glazed *and* funfetti all in the same doughnut? Brilliant! Sign me up! Gives me another reason to use my doughnut pan. I got a donut maker for Christmas! Will have to try these! Any chance you can adjust the printable recipe to print on one page? The last line prints on a second page! Just adjusted the printable recipe..hopefully it will print on one page for you now. For fathers day I guess im going to get him a donut pan… yup guys love donuts… so I should certinly get this pan to make him donuts… yup justified! Your donuts look so FUN, Shelly! 10 minutes? I better stay away from that donut pan:) What a blast you must have had at the Wilton shindig! That tent sale must have been amazing! I can't wait to try these and I would have been in heaven at Wilton's!!!! Oh my goodness….what an incredibly dangerous creation! These look very dangerous!!! But I can't wait to try them. Thanks!!! I so wanted to attend that Wilton event – sorry I missed out! 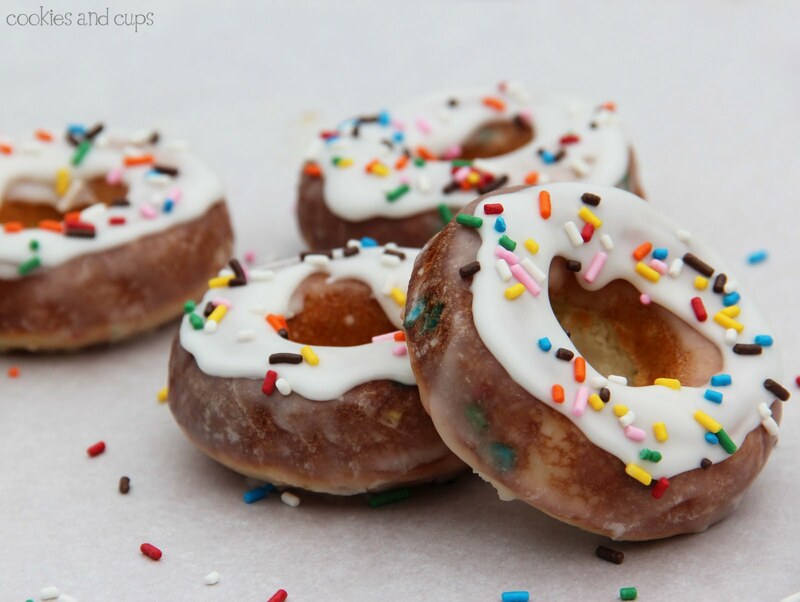 These doughnuts look AMAZING though and I can't wait to try them with my doughnut pan!! Oh, how fun are these! I just love my donut pan, I'm not sure how I lived without it. Ahhh I must get this pan! 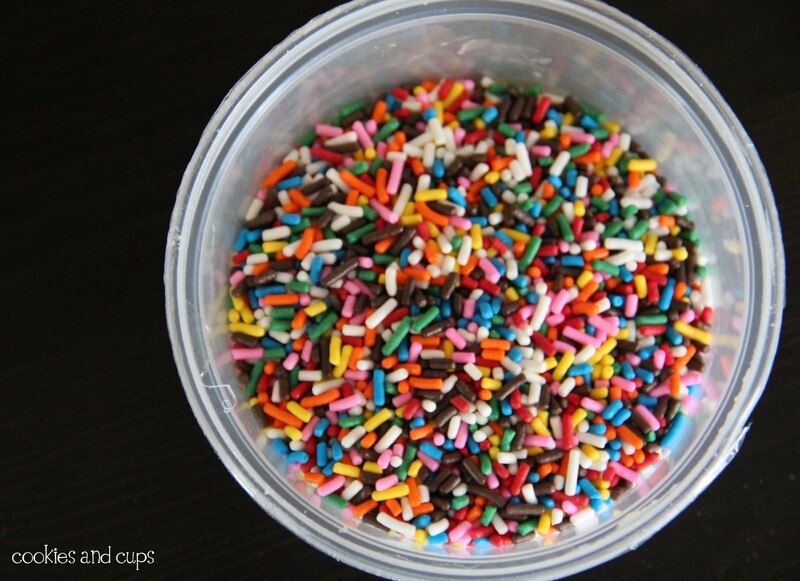 Shelly, I made these with a Devil's Food cake mix and dunked them in the vanilla glaze and added sprinkles. My kids and I loved them! Thanks for the great recipe. Too funny that you should post this! I went to the Wilton tent sale in Woodridge myself two weeks ago and bought this exact same pan! Made chocolate frosted chocolate cake doughnuts for my hubby on Father's day! SOOO good! I am DROOLING at my screen right now!! We just started following you! Love love LOVE your blog! Your right though my waist may not love! Def. worth running an extra few miles though! Are there 2 3/4 cups of cake mix in one cake box? Do I need to get two boxes? How weird! I have a mini donut pan but havent yet used it.. I should give it a try and see if i get the same result. I made these today, they were delicious! Thank you for this awesome recipe! I think you are the love of my life and the devil at the same time. OMG your site makes me so hungry and feel so guilty all at once! I bow to you queen of the kitchen goodies!!!! Awesome recipe! I just made these with my little Donut maker and everything came out perfect! I will definitely be making these again! We featured this recipe in our weekly food trend blog post. You can check it our here. Thanks for the recipe! I’ve been using the donut recipe for a while now. I use a donut maker though, and mix my batter by hand, but I use the measurements and my donuts always turn out great. Haven’t made Funfetti yet though, so far just vanilla and devils food. Just finished these…so good to have this recipe 🙂 Love making donuts for my family. How many donuts does this make?? This is a mini donut pan, right?? 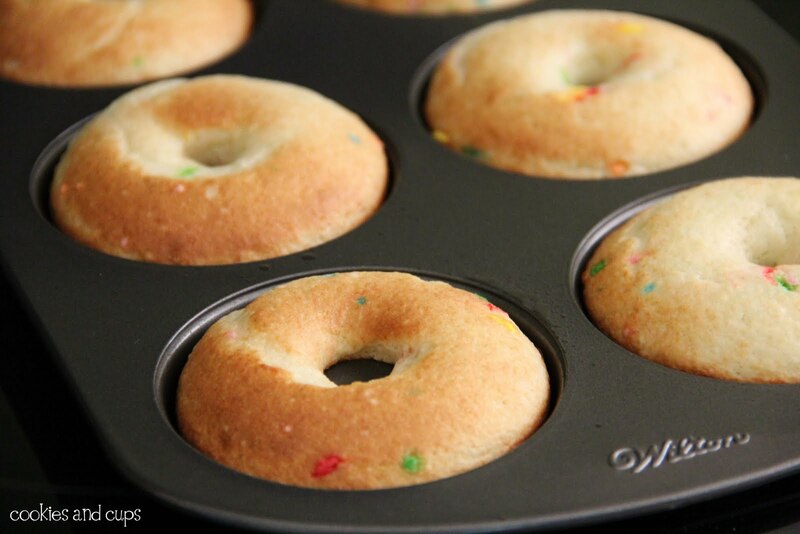 It’s a regular sized donut pan, but you could certainly use a mini pan too, just adjust the baking time. I got about 20 regular sized donuts. How many doughnuts does this recipe make? Can I use plain yogurt instead of buttermilk? I’ve never tried that, but I imagine it would work fine! You can also make your own buttermilk mixing in one tablespoon of white vinegar into 1 cup of milk. This MGHT work using tin foil balled up and sprayed generously with that baker’s joy spray + flour stuff??? I have a mini donut maker (yard sale find- $0.50!!!) that I may try this out in. hi Shelly, I was wondering if i could roll and cut this recipe. Ii don’t have a donut pan, but did buy a donut cutter. Thanks for having such an awesome website and sharing all these great recipes! ahh, no sorry..the batter is too runny. Question…. how many donuts will thus recipe make? Thanks!